Jim has just gone round to Nicola’s on this evening of 9th May 2011, Nicola had decided to open one of her purchases from her recent Islay 2011 (Whisky & Weans) trip and Jim was glad to hear it was a wonderful Bruichladdich. This dram starts it’s maturation in Bourbon Casks and is finished in extra special rare sherry casks from the Bodega Fernando de Castilla. Bruichladdich Distillery is currently re-vamping their website and it should be up and running very soon. Check out Nicola’s blog on her recent visit to Islay, Jim is sure you will enjoy her exploits. 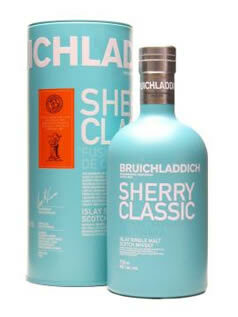 Pour the drams and lets get tasting this great Bruichladdich. Nose…Sweet sherry trifle with lashings of custard, it’s a sweetie, Marks & Spencer’s rhubarb and custard. Taste…Dry, lost the sweetness, replaced with hot spice but the sherry still remains strong. Finish…Long finish, and hot, hot and hot loved every sip. Nose…Smooth and rounded, sweet sherry and honey with vanilla – a dash of water opens up the complex notes. Taste…Drying with some rich salty spice and a little oiliness , sweet sherry richness, the spice giving your tongue a tingle. Finish…A long finish, leaving you warm, a little salt and pepper and a wee touch of smoke. Delightful. Islay does it again, Jim McEwan has another success on his hands, a delightful and rich dram and for around the £35 mark it will not break the bank. Check out the Bruichladdich range, you will be amazed at the number of expressions and there will be one to suit everyone’s palate. This tasting leaves you with only one thought, can I have another. Another big thanks to all at Bruichladdich Distillery for all their work and efforts in creating a fantastic range of Single Malt Whiskies. Check out our Whisky Exchange window below for the Bruichladdich Sherry Cask and some other fine drams from the Bruichladdich range, if you buy a bottle or two today, remember to tell them the Whisky Boys sent you.